I found your blog while doing some research for my husband, and I hope you don’t mind if I shamelessly solicit your opinion on the below situation J. 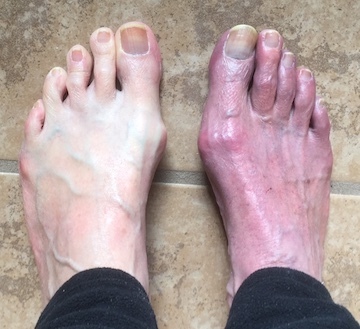 My husband had sesamoidectomy completed on both big toes well over 15 years ago and he continues to have very debilitating flare ups. He is 48, very active, and has a busy work travel schedule and an active job that requires him to be on his feet a large majority of the time. He frequently has flare ups where either his big toe, middle toe, or all toes will become discolored, very inflamed, and extremely painful. During these episodes he takes Naproxen and wears a boot, but he is still in pain even after taking the Naproxen. These events will last anywhere from 2-3 days to over a week, and although he probably wouldn’t admit it, cause him some degree of depression. He has been to his doctor and was recently diagnosed with gout, BUT, his uric acid levels are normal, so I don’t buy it J. I am trying to encourage him to seek out additional opinions on his condition and to get physical therapy of some kind, but I frankly think he is scared. He is very resistant to my suggestions to the point of stubbornness. I can’t quite understand it. I am curious what information I might be able to share with him around physical therapies and exercises for his condition. Everything I have read around joint issues, such as arthritis, is to stay active and keep joints mobile. What are your thoughts? Dr. Blake's comment: Thank you so very much for your email. This situation could be a lot of things, and I agree gout flare-ups quite commonly present like this. His gout test, uric acid in the blood, can just run high normal and he is prone. It would be great if you could find his uric acid level and email to me. I would need his level, and the range of the lab that they consider normal. Does he have any family history of gout? Do you think he has rich foods a lot? Or is he chronically dehydrated? 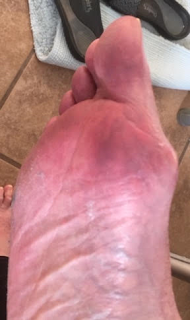 I am writing about a crush injury to my right foot 6 months ago (Aug 21 2018) when a large metal object fell from a top shelf onto my bare right foot I’ve seen a variety of doctors and practitioners, but nothing I’ve learned has improved my condition, and I am in confusion and despair. I’ve read your blog during this time, and your recommendations always make more sense to me. I sent previous emails, but want to try one more time, because the end of my rope is near. As a quick summary, the initial diagnosis was fractured 1st metatarsal. Second doctors found additional fracture to tibial sesamoid (also deformed), 2nd metatarsal (bottom), inflamed MTP joint, nerve sensitivity on top and bottom of foot. Pain has gotten worse rather than better. Sesamoid/metatarsal area feels like shards of broken glass in my foot. MTP joint is sensitive, and I keep my foot wrapped in sheepskin inside the boot for relief. Dr. Blake's comment: That symptom would be intense nerve pain (neuropathic). During the day, pain increases the more active I am (light chores around house); better when I stay off it entirely. During the night, pain can be worse, making it difficult to sleep. I’m still in boot, using wheelchair for total non-weightbearing, homebound from no driving. Bones and joints: No dislocation. Moderate hallux valgus alignment with mild lateral subluxation of base of 1st proximal phalanx. Moderate 1st MTP osteoarthritis; severe sesamoid osteoarthritis. No joint effusions. Ligaments: Lisfranc ligament intact. No evidence of acute injury to collateral ligaments at MTP or IP joints. Tendons and muscles: Mild edema/strain of the medial head of the abductor halluces muscle. Mild muscle atrophy. Dr. Blake's comment: Your symptoms are of nerve pain secondary to the crush injury to an already arthritic big toe joint. Dec 18: 2 Cortisone injections, which caused extreme pain, fever, disorientation. No pain relief, but some reduction in inflammation. Dr. Blake's comment: This is diagnostic as it only addresses inflammation. Since it did not work, the neuropathic pain must be addressed. Physical therapist has helped flexibility/strength in foot, ankle and leg. Electrical stim and light massage reduce pain temporarily, but sometimes nothing can be done because foot is too sensitive. My two doctors recommended 2 different courses of action, both surgery. I resisted. Dr. 1: Aggressive: remove both sesamoids, reconstruct MTP with pins, shave outside of bunion, all in one operation. Dr. 2: Conservative: remove tibial sesasmoid. If that doesn’t work, then remove 2nd sesamoid. If that doesn’t work, reconstruct MTP joint. Dr. Blake's comment: No surgery should be contemplated until neuropathic pain is recognized and addressed. The treatment is not easy, so as soon as you can have the neuropathic pain treated successfully the better. Jan 19: Woken up by worst pain yet, like broken beer bottle jammed in my foot. Decided surgery was necessary. Dr. Blake's comment: Again, this is neuropathic pain, surgery has to wait for now, but could be avoided. Jan 24: Went to yet another doctor for 2nd option on which approach to use; aggressive or conservative. He temporarily put the breaks on, wanting more info. Increased nighttime pain may be related to L4, L5, SI nerve. I need to see ortho spine doc. X-rays show osteopenia in MTP area. Bones may not have integrity to hold pins/screws, creating worse problem in future. I need to see osteoporosis specialist. Dr. Blake's comment: Localized osteopenia could indicate that the neuropathic pain has developed complex regional pain syndrome. I have many blog posts on this subject. I sit here befuddled, exhausted, and defeated. I truly hope that you can provide some clarity on what is happening, and how to best proceed. Thank you for your time and commitment to healing. Dr. Blake's comment: I wrote to the patient at this time that I was on vacation and my response was going to have to be delayed. Hello Dr. Blake. I hope your vacation was rejuvenating! You asked that I resend the email below after your return. Here are a few updates as well. Thank you so much for your generosity. I got a medical marijuana card last week. A daytime tincture hybrid of THC/CBD keeps me alert while reducing pain. The nighttime tincture is 100% Indica for sleep. To my surprise, the daytime product has reduced my pain considerably, particularly around the tibial sesamoid. I’m mainly feeling nerves, but in a lower pain range. The amount of pain I have right now is bearable, which makes me more resistant to surgery. It feels good to have the boot off. I’m still putting all weight on my heel and outside of foot. Only a few steps here and there. Doing exercises recommended by physical therapist. Still in wheelchair most of time. Here is the full array of opinions that have my head spinning. Dr. A (podiatrist): Recommends removal of both sesamoids, rebuilding of MTP joint, shave bunion bump. Should all be done all at once in order to maintain my gait, but also recognizes it will be a difficult recovery. Dr. B (Dr. B's partner): Recommends removal of tibial sesamoid only. If that doesn’t work, then follow with 2nd sesamoid removal, followed by reconstruction of MPT. More conservative approach, but possibility of 3 separate surgeries. Dr. C (my chiropractor): Advises against surgery because of complexity of foot, but if surgery is necessary, then do it all at once. He recommended Dr. D for a second opinion. Dr. D (third podiatrist): Not rushing into surgery after reviewing the MRI. #1 - He thinks the tibial sesamoid is not that deformed, and the pain/inflammation is likely severe osteoarthritis aggravated by the accident. He also thinks some nerve pain may be originating in my lower spine...L4, L5, S1. He asked for a workup from an ortho spine doc. If foot surgery is necessary, he recommends it all be done at once. Dr. Blake's comment: This is my choice of direction, but CRPS has not been discussed? #2 - He is concerned with osteopenia in the big toe joint, and not confident that pins would hold. He wants a workup from an osteoporosis specialist, before he would consider surgery. CNP (my primary provider): She did not understand Dr. Haas’ concerns. #1 - She doesn’t agree lower spine should be an obstacle. She ordered x-rays, and results were as expected. #2 - I had a bone density last March, and there is osteopenia everywhere. It's being treated with Vit D3 caps, and calcium through diet. Marcie doesn’t see a problem with pins holding. She said I’m between a rock and a hard place, but agrees with Dr. B; one bone at a time. Dr. Blake's comment: In California we have pain specialists that are neurologists, physiatrist, or anesthesiologists who need to be consulted. Dr. D was right about the nerve part, but CRPS type 2 is nerve hypersensitivity from nerve injury. This has very specific treatments. Finally, my physical therapist): He has seen my ups and downs more than anyone. Most recent trend is down, so he can’t even do exercises with me, and we've cancelled appointments until this gets sorted out. He said it will be a difficult recovery, but he recommends the full surgery. Dr. Blake's comment: The full surgery is only recommended by caring people who want desperately to help you. You can not blame, but if the pain is neuropathic, the surgery is going in the wrong direction. See if there is a neuro-physical therapist in your area. They have a national organization and are attuned to CRPS. Me: When feeling my foot prior to medical marijuana, I am resigned to surgery. Feeling my foot right now, under the effects of medical marijuana, I don’t want surgery. Bottom Line: where do I go from here? Dr. Blake's first response after vacation (3 weeks ago), but before the two photos above were seen. Just read through all the emails to get my brain working. Do you have any images you should send of xrays or MRIs? If you have surgery on your foot, you only want the tibial sesamoid removed for sure. More and more surgery at one time is less predictable, and more trauma to your body. You had a very bad accident, which everyone wants to help you with, but more surgery does not make sense right now. I’m writing because I’m stuck, and need to make a decision on treatment for my foot. Last night, I had another high pain episode. My physical and emotional reserves are depleted after 5 months since the injury. It is very generous of you to provide your expertise, and i cannot imagine how busy you are. While understanding that, I also need to make a decision soon about surgery. I’ve been putting it off for months, and my foot is only worse. Is it possible to talk by phone/Skype, or do you have enough info to make a recommendation in writing? I am so happy to make a contribution to your blog or pay you outright for your time. I just don’t know where else to turn. This is another image of the intense inflammation under the tibial sesamoid in the subcutaneous fat, the tibial sesamoid looks arthritic, but it does not looked fractured or needing to be removed. The arrow is on the flexor hallucis longus showing intense inflammation above near the fibular sesamoid. I wonder with the injury if the ligament connecting the 2 sesamoids was not torn. This would explain why the fibular sesamoid in the earlier images looked way out of place. This image points to the gap between the tibial and fibular sesamoids possibly created by a tear of the ligament. Another view of some mild wear and tear. Thank you, Dr Blake. This is important information. I’ve been regulating pain with medical marijuana (mm), and also using the Curable app. Both are helping a lot with calming down my nervous system, reducing discoloration and swelling. Mm is supposed to be good for nerve repair. Reading that I probably need surgery has released a flood of anxiety, and I’ll focus on that now. Dr. Blake's comment: Yes, if you need surgery due to the fibular sesamoid out of alignment, that can wait and you may avoid it. Get the CRPS evaluated. Sounds like you are already calming your nervous system. On your recommendation, I introduced the Curable app for nerve pain in a recent blog post. It definitely looks promising. Keep me in the loop. I am just learning about the app from a patient. It is called "Curable". I downloaded to my iphone and I my initial impression is favorable. We all know that when pain is out of control, and has a mind of its own, like hurting when you are not doing anything, the brain wiring to your foot or wherever can be too excited. You can then hurt just because your body senses danger, not because you really should hurt from the injury, or hurt as much as you do. My blog has many discussions and tips on dealing with chronic pain, but you can never have enough. Try it for a month and see if it works and calming down the pain. We are trying to relax the nervous system, give it time off, so it can go back to only its normal function of sensing pain. I've posted on your blog in the past and have appreciated your advice more than you know. The advice you had given me a while back had given me some hope. After seeing a host of what I feel to be incompetent Foot and Ankle surgeons and Podiatrists who have all seemed to throw their arms up, I've finally gotten 2 new bilateral MRI's of the ankle and a new Podiatrist. 1) Mild scarring of the anterior talofibular and calcaneofibular ligaments, remote inversion injury. 4) Small tibiotalar joint effusion. Dr. Blake's comment: This is typical for anyone over 40 years old, and really not meaningful. It is the normal wear and tear of an ankle, injury or just life related and the march of time. Dr. Blake's comment: It does not have to be an acute injury. If you are over 40, it can just be wear and tear on the ligaments with some breakdown or repair with scarring. These problems can lead to some ankle instability and pain. You treat with braces, taping, or muscle strengthening, depends on the stage of Rehabilitation you are. I also had an MRI of my left leg which is the worst of the two ankles. It showed mild edema around the pre-tibia. Dr. Blake's comment: Again, the edema is from pulling of the muscles, like shin splints, and should be treated with icing, some Physical therapy if limited area, and muscle strengthening of the extensors. The Podiatrist went on to tell me that I had edema around the the muscles and tendons of the leg/ankle and foot. He wants to do a debridement of the achilles and peroneal tendons and a Strayer procedure bilaterally, which to be honest, has me panic-stricken. I had seen an Orthopedic doctor in his same building after both MRI's were complete and he thought that everything looked fine on all imaging. I don't understand why the Podiatrist would want to do such extreme surgeries on both feet if the Radiologist's report mentioned nothing except the above. 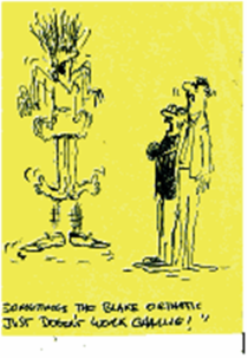 The Orthopedic and Podiatrist only agreed on one issue, disuse atrophy. Dr. Blake's comment: Sounds like a surgical podiatrist trying to find a reason to do surgery. Definitely, podiatrists and orthopedists should be in agreement with surgery in general, and they will have different surgical approaches. I can not tell you who is right for you, but you need some other opinions. I would find a conservative podiatrist who you can bounce off what the podiatrist said to see if there is any hidden truth. If you trust the orthopedist, find out how to treat it. That is what is really important here, but you need more options. You need to know what your diagnosis is! I know you're a busy man but would it be possible for me to pay you for a consultation to read over these MRI's to get your opinion? I would be willing to either mail/upload my MRI's if you'd consider a consultation with payment, of course. Dr. Blake's comment: Yes, but no payment is required. Just mail to Dr. Rich Blake, 900 Hyde Street, San Francisco, CA, 94109. I am reading one for a patient from New Mexico tomorrow. To me, I've already been stuck in bed for nearly 2 years with minimal walking and all this surgery seems extreme to me. I wanted another opinion on these MRI's, didn't know who to turn to and you came to mind. You're an intelligent man (I've read over your site many times) and I'd like for another set of eyes on these MRI's to see if all of these surgeries are really necessary. I understand you can't physically examine me, but only to give your opinion on the MRI's prior to proceeding with such extreme surgeries on both ankles/feet. I appreciate you taking the time to read this over. If you don't have the time, I understand. At this point, I feel so desperate and don't where to turn. I value your thoughts and advice. I often wished you lived here as I don't think I would've been in this condition for almost 2 years. My mom, a long time supporter of yours, sent me your blog after I learned last week that I fractured my 5th metatarsal on my left foot. For a quick background, I am a 30 y/o female. I have not exercised regularly since October thanks to grad school applications, but otherwise lead an active lifestyle; until recently, public transport and walking were major components of my daily life. I fractured my foot one month ago...walking down the staircase. It was that simple. I've sprained my right ankle many times and the situation felt very similar to previous falls but my actual foot took the brunt of the fall, and my ankle remained unscathed. After ~48 hours of being unable to bear weight, I visited two NPs, one at a general immediate care facility and one at ortho-specific immediate care. Both took xrays, and both confirmed no fracture. Ortho NP put me in a walking boot and said I should be fine in 2 weeks. I did have some pain initially bearing weight in the boot but it was an otherwise overnight transformation: my swelling went down immediately and I was able to bear weight w/o the boot (though limping) pain free the next morning. I thought I would back to normal in no time! Dr. Blake's comment: This is always a dilemma since it can take up to a month for a small stress fracture to show up on x-ray. It will be hot on a bone scan and MRI in a few days, but these are more expensive tests and not used in the screening process. Three weeks went by, however, and my healing had plateaued. I made it into a podiatrist one week ago who ordered new xrays (weight bearing this time) and immediately found the fracture. His diagnosis was "5th metatarsal base fracture" but I never recall him mentioning "Jones." He told me that I'll need to be in boot 6-8 more weeks and my injury was a bit tricky because the specific area receives little bloody supply. Dr. Blake's comment: This is the area of a Jones fracture just in front (towards the toes) of where the 4th and 5th metatarsals join together. Told me to stay off my feet as much as possible and make some lifestyle modifications (note to work from home as much as I need) but never mentioned complete non-weight bearing nor suggested anything like crutches. Wasn't super interested in the prospect of surgery and said the next step will be a bone simulator if it comes to that. Follow up apt in 3 weeks. Dr. Blake's comment: Many insurance companies require 3 months of treatment for fractures before they approve a bone stimulator, however the doctor should start the process on Jones fractures, sesamoid fractures, and navicular fractures, since they are the slowest to heal and surgery potential is high. Of course, I googled 5th metatarsal fractures and immediately Jones fractures met his description of my injury, but the standard treatment (NWB for at least 6 weeks) was a different than his. I am now working from home 2-3 days a week, Ubering to work (as opposed to metro), getting groceries delivered, etc. Prior to my diagnosis, I was much less conservative and was actually walking up to as much as 2 miles some days of the week (it's so hard not to do this living in a city) in my boot. Dr. Blake's comment: There is a protocol for Jones of non weight bearing for sure. You can have someone non weight bearing in a boot by floating the fifth metatarsal with adhesive felt padding. Therefore they can walk, and still off load the bone. The secret is creating 0-2 pain level for healing, and what it requires to accomplish that. If it is a Jones fracture, we definitely off weight for a while, but we want the weight bearing for bone mineralization and swelling reduction. It is a fine line. Maybe he does not think it is unstable, which is how it sounds, if it was only picked up on the 3rd set of xrays. Maybe there is no gap, just changes in the bone reflecting healing. If you can take a photo, and email mail of the xray images, I can let you know what I think. You aren't able to view my xrays or examine me, so I know your insights are limited. Still, I am wondering if my doc's treatment plan sounds potentially reasonable assuming a Jones' fracture or if I need to second guess him and go down a far more conservative route and eliminate all weight bearing. I've read a few academic journals and the consensus about treatments seem to be...all over the place. For what it's worth, my symptoms are probably improving, at least in terms of swelling and bruising, and certainly not deteriorating. Some days I am a little more tender and swollen than others, but compression socks and a session with frozen vegetables always do the trick and get me back to my "baseline." I'm not taking any pain meds (especially not NSAIDs) nor am I a smoker. Taking calcium, D3, and magnesium supplements and trying to up my calorie intake. I also assume that, in terms of WB, it can't hurt that I weigh less than 110 lbs. Any insight you have would be so appreciated. Dr. Blake's comment: Send me the images, have the doctor float the bone in the boot, use crutches with the boot if you can not achieve 0-2 pain level. Start doing contrast bathing twice daily to flush out pain from the swelling. This is a must since you want to make decisions on the fracture pain, not on the pain from swelling. Push for the bone stimulator process to begin, even if you do not need it in the end. I got a hold of my medical chart online so I have a few more pieces of info. My diagnosis on the chart is "L 5th metatarsal styloid process fracture" and he also noted that it is nondisplaced. From my understanding (which could be completely flawed), styloid fractures fall in the same group as zone1/tuberosity/avulsion/pseudo Jones fractures, aka the GOOD type of fracture to have. I'm wondering why, then, he said I was dealing a stubborn fracture that receives little blood flow and there is a chance I could have delayed or nonunion--these seem like hallmark Jones characteristics. Dr. Blake's comment: Yes, that is good news and the styloid process fractures tend to heal just fine. Still, take a photo and send. You can ask the office to take a photo of each of the xrays and email to you. Maybe they will do it. Then the patient responded with good news!! Thanks so much for your reply on your blog! I decided to just call my podiatrist and I have good news: I do NOT have a Jones fracture. It didn't occur at the very base of the 5th metatarsal, but it was not distal enough to be a Jones fracture; therefore it is still in zone 1 and he confirmed that it's still receiving adequate blood supply. He told me that if it had been a Jones fracture, he would have put me in a hard cast and would not have let me leave his office without crutches. Here's what's interesting: he said it was not an avulsion fracture, either (or a pseudo Jones). I've been hard pressed to find any online sources that do not classify styloid process fractures (my official diagnosis) as avulsion fractures, but I suppose that was not the mechanism of action that caused the injury. I'll ask him to clarify this on Friday during my follow up. I am also curious to hear more about his mentioning of poor blood supply. I suppose he meant that feet in general receive less blood supply compared to the rest of the body. His treatment plan (8-12 weeks in walking boot) also seems to be more aggressive than those of other avulsion fractures (or anything in zone 1), but I read in one of your earlier posts that you think these types of fractures tend to be undertreated; perhaps his philosophy aligns with yours. In any event, I hit the 6 week mark last week, and since then, my foot has started to feel much better. Best way I can describe it is that it feels more like a regular foot that can do its job again. I feel like I could walk more normally on it when my cast is off (he gave me permission to do a little walking around my apartment w/o the cast so long as I concentrated my weight in my heal) but I'll wait until my appointment before I get clearance. To the naked untrained eye, it does not look like my foot is injured. However, if you look closely, I have a bump where the fracture is. I am not sure if that is the callus and/or residual inflammation. The only thing bothering me now is my walking boot, whose front straps occasionally press against the area of the fracture and cause tenderness (just depends on the day). He said that had he come to me first, he would have put me a different type of walking cast with air pockets, so maybe that one would be a bit better. Also, the muscle atrophy, which is all the way up my thigh, is pretty bad, and my pants are baggier. I'm starting to do some NWB floor exercises, and will probably ask for a physical therapy order. I will ask for both sets of x-rays next visit and will be sure to share. As for the old ones, I took them sitting down on a large x-ray table. My x-rays at his office were taken in a completely different manner (standing up, bearing weight) which he explained was key. I gave him my old x-rays but they were taken at awkward angles and were incompatible with his computer. My own images are attached. Don't be alarmed by the fact that my right ankle is bigger than left--that's old scar tissue from a previous injury. I came across your website when researching sesamoids. Apologies in advanced for the long email but i hope you can read through it and provide me some guidance. I have been dealing with my sesamoiditis since May of 2018. It started with improper Cycling equipment (tight shoes, wrong cleat positions and wedges/shims). The pain came and i removed the wedges, got proper shoes and proper cleat fit and continued cycling for the most part pain free just inflammation of the toe and pain during walking or bending of the toe. After sometime i went to the first of 2 doctors and we did the dancers pad and a small sandal/boot for 2 weeks with dancers pad without cycling, i then convinced him i wanted to bike because of the carbon shoe in cycling and high arch support insole, cycling would not be an issue. He agreed and i was back on the bike training as usual, - i do it competitively so its around 2 hours a day almost every day and longer on weekends (4-5 hours). Also some gym workouts usually focusing on leg strength. It didn't get any better and we tried an injection of cortisone on the foot and continued as is, cycling almost daily and using the dancers pads. Dr. Blake's comment: There must be a better way to train so you can have more recovery time for your body, even when you are not injured. Without recovery time in sports, you always run the risk of tissue fatigue and resulting injury. It is a fine line. Do you have a cycling coach? What is his philosophy? I got an x-ray and an MRI and all it showed at the time was inflammation no fractures. After some time i decided to see a new doctor recommended by a friend who put me on Hokas and an Atrex orthotic for my work shoes (office job). He also got me a more serious walking boot (one you would get for fractures) up to the knee and i got completely off the bike for about a month due to an accident, during this time i only wore this boot and did some aggressive Epson salt baths and daily icing. Dr. Blake's comment: Hopefully this is the start of your healing!! Going back to the doctor, we did an Xray and it showed again the sesamoid bones were good no fractures but there was still swelling, so he took me off the boot gave me a lot of confidence that cycling was not an issue and to continue cycling at full strength and use orthotics and good shoes when I was not on the bike so i did. The inflammation never went away but i was pain free on the bike so i continued cycling and wearing the shoes as advised and attempted some nighttime walks on the Hokas. Dr. Blake's comment: For those who do not know Hokas, they have a roll in the forefoot so you do not have to bend the metatarsals. There are various types of Hokas, and some have the roll in a good place for an injury, but some do not. Some experimentation with various Hokas may be needed. Typically, I would also allow you to cycle if you are keeping the pain between 0-2, and really work hard on protecting the sesamoid area and controlling the inflammation. Were you pain free, or at least 0-2 in the boot, that is the goal? A couple of weeks ago after a day of walking at Universal Studios park my feet were in some serious pain, i also started cycling in dirt/off road about a month ago which caused more stress and i would feel it more on the bottom of the foot. Due to the higher than normal pain during universal i went back to the doctor where the xray showed now a fragmentation of the inner sesamoid. And this is where i am at now. Dr. Blake's comment: Wow, that is very disappointing. I am surprised nothing showed on previous xrays. When you said the MRI did not show sesamoid fracture, but did show swelling, was any of that swelling in the sesamoid (a possible sign of a stress fracture)? At this point i am dealing with some neck/lower back issues and i am off the bike again while i figure out that situation. So again i can get off cycling and let the foot relax heal a bit but its not looking good for me. I am now considering surgery due to this new development of the fracture. The doctor described is no blood flow in the area causing it to fragment. From your experience since my main focus is cycling and on the bike i don't really have pain should i continue trying conservative treatments while returning to bike competitively. Dr. Blake's comment: I have never found that if you are damaging something you have no pain, unless you have masked the pain with pain killers or cortisone shots. Definitely stay away from cortisone injections. Next time you see the doc ask them to show you the MRI images that show that most swelling so you can email me. Also take a photo of every x-ray image, first to now, and email so I can appreciate the progression. My gut level is cycle, boot rest of the time in creating 0-2 pain level, Exogen bone stimulator for 9 months, contrast bathing every night for circulation, and acupuncture for circulation if you can get it. Also get Vitamin D levels, and if you are low, bone density. What is your experience mainly around cycling and this injury, if i were a runner things would be different but how much damage am i causing by cycling on it and at this point with the fracture of the bone and the lack of blood flow causing it to fragment am i doing or have i already done permanent damage down there? I know without imaging it will be hard for you to assist me but any insight you can provide will be helpful. Dr. Blake's comment: You are welcome. All was okay in your story until the fragmentation. If insurance is okay, get a CT scan of your foot which shows the bone so much better. Again, cycling should be fine if you can keep the pain level between 0-2, and you do not have any increase in pain afterwards. Hope this helps some. And then the patient responded with an Important Decision!! Thank you so much for taking the time to write back to me and for your recommendation. This injury is frustrating to say the least, it's beaten me and I have decided on surgery to remove the lateral sesamoid. Surgery is scheduled for March, hope to have a successful surgery and recovery. Thank you again for lifting my spirits today. Honestly can’t express in words how much the appointment meant to me.